I think I need this. I need to buy it. Or make it. Either way, I think I need this. 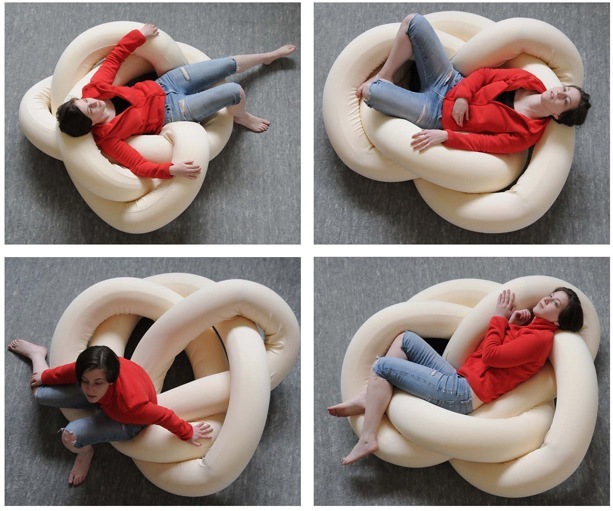 Yes, it’s a Knot Lounge Chair, discovered on one of my top favorite websites, Craftzine. a) lots of measuring and sketching. b) hunting down the most comfy fabric ever. c) asking around for the best chair-stuffing recommendations. d) extra free time…correction: any free time. What are your thoughts? Can I do it? How would you do it?? I don’t know that I could really relax in something like that because of the way my mind works. I would be constantly thinking about how to unknot the chair. I really don’t think this would be too tough of a project. (And what an end result! Want!) Just make a big cylinder gradually, stuffing it as you go. As you finish each section, weave it into the growing knot. My thoughts? We need these 🙂 I’m feeling a project day coming on soon. Ok so maybe several partial project days given our schedules … but maybe after a few of our matinee shows? Cute..but where would you put it? Biggest challenge = determining what material and stuffing would work best, and then figuring out how much I would need. Mom…I would put it on, next to, or in place of the little saucer chair in my room right now 🙂 slash, I would probably live in it and drag it around the house with me like Linus and his blanket. E-mail me. I can point you in the right stuffing direction. I can give you a hint, the stuffing is not loose and fluffy, it determines the structure of the chair. I can send better info to anyone as long as it is not used for commercial purposes. I just saw the post and would really like to know what to use for the stuffing of thief knot chair. I’m thinking of taking it on as well. Please email me if you know. Sorry this is all the info I have! I saw it online.